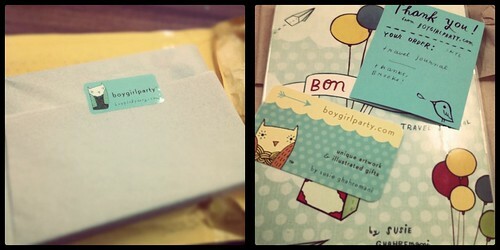 Today I received a lovely parcel in the post. After finding a link to this travel journal on SRSLYLIZ.com I knew as soon as I saw this listing on etsy that I needed to own this travel journey. * It's full color throughout, whimsically illustrated by me with birds in roller skates, cats and owls being carried away by balloons, and paper airplanes! * It measures about 5.5 x 7.5"
I'm a traveller and I love to have somewhere nice to write my stories as I'm travelling. I feel less inspired when I don't have somewhere beautiful to write. 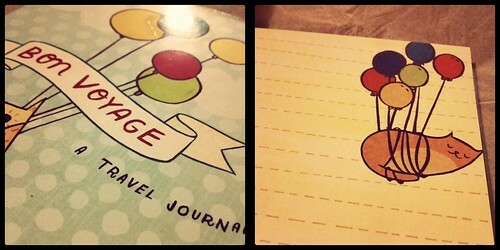 I've always been on the look out for fun pretty affordable travel journals and have usually come up short. For some reason shops in Australia either don't sell travel journals, or they come unlined, or they're really expensive and ugly. This travel journal is different. As soon as I opened it I was in love. It's the perfect size, not super heavy and it's SO ADORABLE! I want to go on a big adventure so that I can fill it's pages with my travel stories and little mementos. 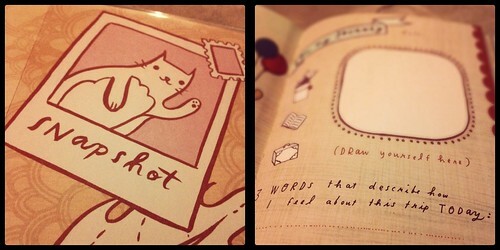 I want to take instax mini photos on my adventure and stick them into my new journal. I want to get home and be able to flick through filled pages and smile and remember all the fun I have had along the way. I'm already thinking about who I can gift one of these travel journals to - unfortunately most of my friends don't have plans for big travel adventures at the moment but I'm sure someone out there will be able to find someone who could use one of these journals. There are also some fun notebooks, t-shirts and recipe cards as well as other items in her etsy shop - if the quality is anything like this journal, you won't be disappointed. Can I get a month off to travel now? Plans are for the USA in October but that seems like so far away (here I am complaining after I just posted that I'm going to Thailand at the end of next month - can anyone say lame?). thank you so much, brooke! i'm so happy you love it! I've always loved her little handmade notebooks! Too cute and such a great present for a traveller. Amy - It really is, and SO well made!!! Susie - Thank YOU for making such a cute travel journal. You have NO idea how long I've looked for something like this! !